Singaporean iPad, iPhone and Android Blog: Dual Sim Adapters for iPhone 4: Using a Normal 3G Sim Card and your microsim at the same time. 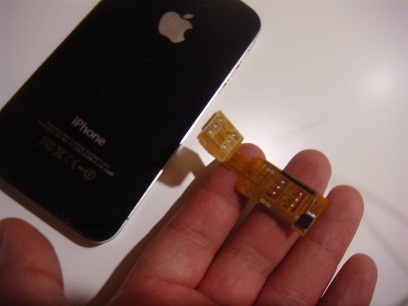 Dual Sim Adapters for iPhone 4: Using a Normal 3G Sim Card and your microsim at the same time. Let’s face it. For those of us early adopters of microsim cards because of iPhone 4, we know that microsim cards are not catching on in any other phone model and is likely to stay that way for a while. However, for about S$25-30 or about US$20, the Chinese have developed a dual simcard adaptor that allows you to slot in a normal-sized simcard with an external adaptor, while at the same time allowing you to keep your existing Iphone 4 microsim in the simcard tray – in layman terms, this means that the 2 simcards (Normal Sim + Microsim) are essentially paired up much like batteries connecting in series. There is a nifty but tiny circuitry in the adaptor that works seamlessly with the iPhone 4 under Settings>Phone>Sim Applications that allows toggling between either simcard. If you are a traveller who believes in purchasing prepaid foreigh simcards for cheaper local call rates when you are in a foreign country, then this dual sim adaptor makes perfect sense. You can use your own micro simcard as default, and toggle to the local simcard whenever you need to make calls. As you can see in my photo, one end of the flat ribbon cable has to be placed under the Iphone 4 microsim and positioned within the Iphone 4 microsim tray. As a result of the additional thickness, the simcard tray is a little stiff when pushed back into the Iphone. The other end of the flat ribbon cable then sticks out of the simcard tray and is connected to the external simcard adaptor. Most of us would then no longer need to fiddle with the microsim card and tray because we would only need to change simcards at the external adaptor end. That is however not the end of it all because the dual sim adaptor comes with a special external casing that includes a pocket space to hold the dual sim adaptor in place. You can see manufacturer pictures of the external casing and the dual sim adaptor at the official QYG website over here. Other than a 5-10 second lag (due to reacquisition of phone network by the simcard) when I toggled between the microsim and the external simcard, there was no noticeable issue. The manufacturer, QYG, also offers a tri-simcard adaptor for slightly more. The only negative about using the dual sim adaptor is that the phone casing with the special pocket for the external sim adaptor only comes in limited designs. (Mine was a matte finish). If you happen to be in Singapore, it is easily available at the major electronics malls. I am pretty sure that you can purchase this item from an online retailer or if you visit China and Hong Kong. Dual Sim Adapter phones have until recent years been largely eschewed by the larger phone manufacturers partly due to their close ties with mobile phone networks who would prefer that customers use only one network exclusively. I would like to buy one, can you let me know where to buy it in Singapore. I tried to find it till now can't get it.